On Friday, the University held an event to celebrate its partnership with Argonne National Laboratory, Fermi National Accelerator Laboratory, and the Marine Biological Laboratory in the new Eckhardt Center. The event was briefly interrupted by demonstrators carrying signs calling for the University to divest in companies that use fossil fuels. The demonstrators represented “Stop Funding Climate Change, UChicago” (SFCC), a campaign run by the UChicago Climate Action Network (UCAN) that has been ongoing since late 2012. The program commenced with a brief address by President Zimmer in which he emphasized the importance of technological innovation. 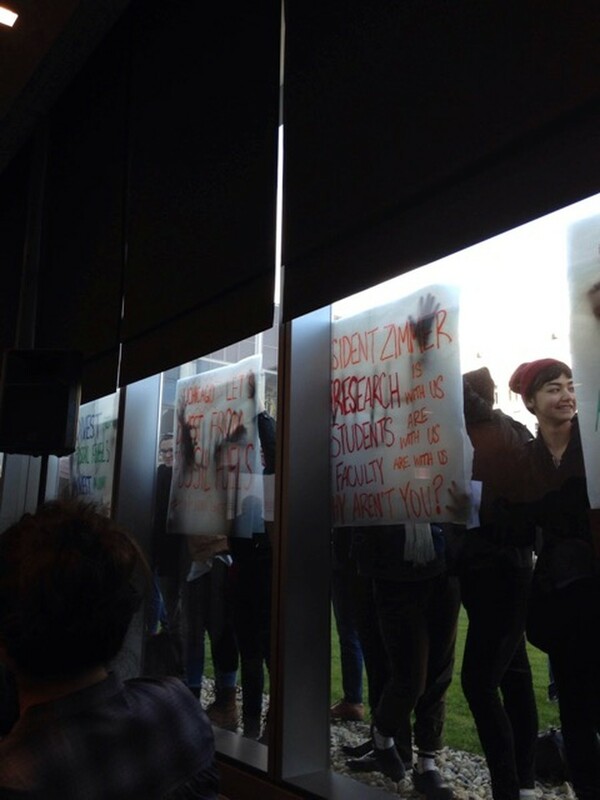 Directly before his speech, the protesters gathered outside the window in the Eckhardt courtyard and pressed their signs to the glass for the audience to see. According to Perl, the protest was meant exclusively to capture the attention of Zimmer himself rather than to challenge any of the scientists represented directly. The UChicago and Affiliated Labs event was chosen as an ideal place to stage the demonstration because it “was uniquely suited to highlight the hypocrisy between celebrating climate science research while continuing to fund climate change by investing in fossil fuels,” Perl said in an email. Before Zimmer entered the room, however, the organizers of the event closed the shades, and the demonstrators resorted to shouting. Although Zimmer’s speech was punctuated by the students’ chants, he did not acknowledge the demonstration. Mayor Rahm Emanuel, who spoke briefly after Zimmer about the influence colleges have on the city of Chicago, joked that the noise made him feel like he was in a City Council meeting. The protesters quieted in time for the mayor to conclude his speech and the presentations continued without interruption. Provost Eric Isaacs began the event with an extended interview of Dr. Walter Massey, the President of the School of the Art Institute of Chicago and the former Director of Argonne National Laboratory. Massey emphasized the constraint that government contracts often put on scientists in other laboratories. “The idea of having a culture of intellectual freedom and academic inquiry that the universities could bring to the lab is very important,” Massey said. Isaacs then led a discussion with all three of the current laboratory presidents: Dr. Peter Littlewood of Argonne National Laboratory, Dr. Nigel Lockyer of Fermi National Accelerator Laboratory, and Dr. Huntington Willard of the Marine Biological Laboratory. They spoke about the nature of working with universities and the importance of teamwork and communication in scientific inquiry. After their conversation, the crowd of approximately 130 students and scientists was allowed to ask questions. Fourth-year UCAN member Spencer Chan brought attention back to the demonstration by asking the directors how the University can reconcile working to develop clean energy with continuing to fund fossil fuels. However, the SFCC maintained their stance that University divestment is an essential step on the road to transitioning to clean energy. “UChicago has the powerful opportunity to pair research with action,” said Perl. The event concluded with four individual scientists from the laboratories explaining their research, as well as closing remarks from Isaacs in which he praised the partnerships and looked optimistically toward the future. “The idea that we as a group of four institutions and beyond can continue to do this kind of great work is only getting stronger and stronger,” Isaacs concluded.